Choose this toy set for your beloved furry friend, they will enjoy playing with it. This measurements are perfect for small and medium bird for the perfect fitting. Size: Bird Swing- Length 12.6Inch * Wide 9.5 Inch. Small Star Ball - 7.9'' x 2''. 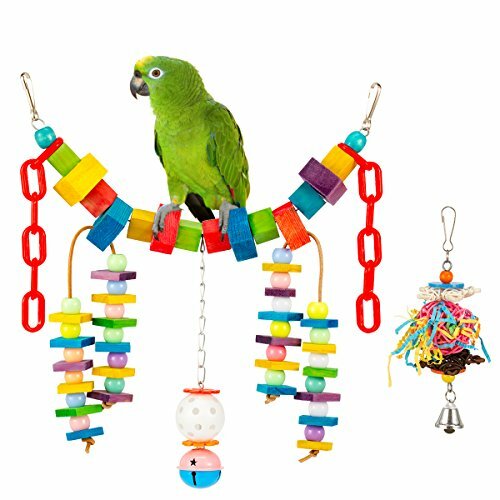 The hanging bridge suits for all kinds of parrots' cages，and can be easily and quickly linked to cages.The star ball is a great chewing toy for small birds. The color is bright and vivid, which is a beautiful decor to hang into the bird cage or wall at home.When meeting the water, the product has a noticeable fade to ensure that no artificial gel and colors has been used. It is therefore safe for the pets and will not harm them. When your bird does not stand on the swing, the matching falling wood can also help her to kill time and give dental care for your beloved bird.The Star Ball is made of ratten weaving with bell for chewing,paper to pull and shred，and satisfy a bird's instinctual need to chew. Metal connector can be either a vertical or hanging in a cage. If you have any questions about this product by MEWTOGO, contact us by completing and submitting the form below. If you are looking for a specif part number, please include it with your message.